Author: Anbessa Teferra, Grover Hudson. Series edited by: Wilhelm J.G. Möhlig, Bernd Heine. Amharic is one of the fifty most important languages in the world, in terms of number of speakers, and political, historical, and cultural importance. Its eighteen million or so speakers live mainly in Ethiopia, but as the result of emigration since the 1970s, hundreds of thousands in Amharic speakers now reside in Europe, the U.S., and Israel. Because of its importance as a Semitic, African, and Ethiopian language, Amharic more than other African languages has benefitted from the interest of linguists, who have written much on the language. This book satisfies the need for a thorough book-length introduction to Amharic which includes an introduction to Amharic history and society (Part 1), a basic survey of the grammar including the writing system (Part 2), and lengthy Amharic-English and English-Amharic wordlists (Part 4). Amharic examples are fully presented in phonetic writing so knowledge of the Amharic writing system is not required, while much of the grammar and vocabulary are also presented in Amharic writing for those who want and expect it. For those who want to learn to read Amharic a thorough presentation of the Amharic writing system is provided, and as Part 3 a set of graded lessons to learn it, as a way to write English. This is a book for adult learners of Amharic, for linguists, and students of Ethiopian history, society, phonetics, grammar, vocabulary, and writing system of this major language of Ethiopia. On the linguistics level, the study offers some new perceptions and approaches to describing the Amharic language (transcription, gemination) and touches upon the very heart of essentiality. It is a product of and a material for teaching/learning Amharic, and, thanks to some grammatical and pragmatic notes, it might be an excellent starting point for further analysis in the field of applied linguistics, as well as for further exploration and description of the Amharic language. “Essentials of Amharic” zeichnet sich einerseits durch ein umfangreiches Themenfeld, andererseits durch eine kompakte Darstellung der Themen aus. Durch die Vielfalt der angesprochenen Themen wird das Interesse des Lesers stets geweckt und durch Verweise auf weiterführende und ergänzende Literatur auch praktisch gedeckt. Als Lehrbuch ist es zum größten Teil methodisch und didaktisch sehr gut den Bedürfnissen eines sprachinteressierten Lesers angepasst. Grover Hudson (Yirgalem 63-65) who for many years taught linguistics at Michigan State university where he wrote enough scholarly articles about Semitic languages to give those of us who struggled with Amharic a headache just reading the titles, has written a wonderful non-headache-inducing book called Essentials of Amharic. Essentials of Amharic was the companion volume of an unpublished textbook and served as a grammar/reference text with some basic exercises that – if the spirit and mind are willing – will bring back some Amharic from the deep recesses of our memories. Hudson has devised entertaining exercises to raise one’s Amharic script reading skill by reading English words transliterated into Amharic script. These are more fun than the morning crossword puzzle. Also entertaining and highly educational are a set of essays about the origins of the language, the history of scripts, and, yes, the secrets of verb stems. The book written with Anbessa Teferra and published in Germany in a handsome volume by Rüdiger Köppe Verlag, Cologne. This textbook is targeted for learners who want to learn to understand and speak Amharic without necessarily bother to struggle with the cumbersome fidel writing system. To summarize my conclusion at first, I find the book in general pedagogical and uncontroversial. A diligent student can learn the essentials of Amharic from this book. [...] I am particularly impressed with the comparative completeness and accuracy of the grammatical description within such a short space. 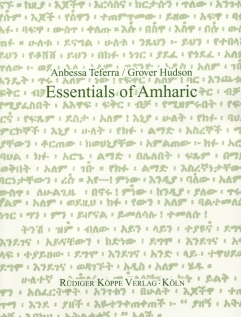 The book “Essentials of Amharic” presents a unique mixture of different categories and with regard to the heterogeneity of the targeted users certainly serves its purpose as a broad overview of different aspects of Amharic.